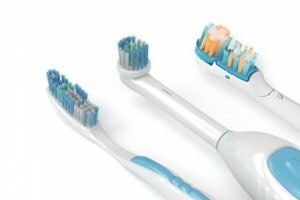 Generally speaking there are actually three types of toothbrushes on the market: Rechargeable Electric Toothbrushes, Regular Manual Toothbrushes, and Battery Power Toothbrushes. Rechargeable Electric Toothbrush: These power brushes plug into the wall to recharge and are made up of a power base and a brush head which you replace every three months. Their electric charge works to power a specific cleaning technology such as oscillating-rotating or sonic technology. Manual Toothbrush: Basic toothbrushes that consist of plastic handles and nylon bristles, these have no internal power source. Battery Power Toothbrush: Often seen as an “in-between” option, these toothbrushes are powered by AA batteries. They are similar in design to manual toothbrushes but have a slight vibration added to their cleaning action. The BEST option that will provide the most efficient and effective plaque removal is the Rechargeable Electric Toothbrush. Differences do exist brand-to-brand, but in general these brushes use science based technology to sweep plaque and food particles away from your teeth at a faster and more effective rate than a manual toothbrush alone. Another benefit these brushes provide is running for a full two minutes which is a longer time than the average individual brushes with a manual brush. Battery Powered Brushes also often run for a full two minutes. The vibrating motion of these brushes does not aid a significant amount in mechanical removal of plaque and food debris. However, they are a great option for children who would not otherwise brush for two minutes. 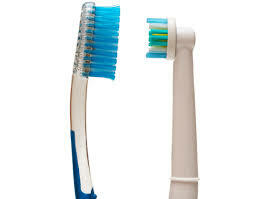 Manual Toothbrushes are the most commonly found and cheapest option of the three. It is important to always opt for a soft bristled toothbrush and make sure you are brushing for longer, NOT harder. At Adams and Cheek Dentistry, we have Oral B Power brushes available for purchase as well as providing complimentary manual toothbrushes to patients at regular cleaning appointments. For more information about Power vs. Manual Toothbrushes from Oral-B, click here.